The Chard 10.5qt. 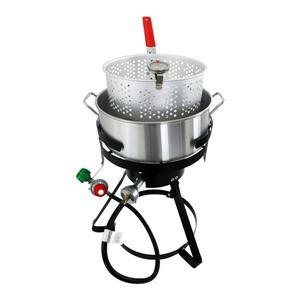 Outdoor Fish & Wing Fryer comes with everything you need to begin your outdoor cooking experience! You can fry, boil, and steam. Featuring a durable, heavy-duty 10.5-quart aluminum cooking pot with a powerful 50,000 BTU cast iron burner and stable 21" tripod stand, this model also includes a CSA-approved regulator with hose. The unit also comes with an interior fry basket with cool-touch handle and a 5" deep-fry thermometer. Whether you are cooking the Sunday family dinner or the weekend backyard get-together, the Chard 10.5-quart Outdoor Fish & Wing Fryer gives you the right tools to make it yours! Cast Iron & Aluminum. Black/Aluminum.